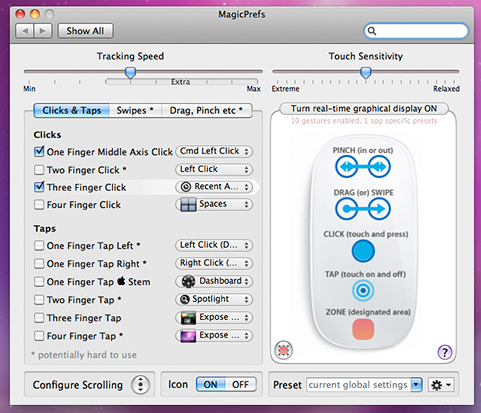 MagicPrefs is an amazing free utility for Mac that dramatically improves the functionality of your multi-touch Magic Mouse. Other than allowing for increased control over the touch sensitivity and tracking speed, you get practically full access to the multi-touch capabilities of the device. With MagicPrefs you can bind various gestures, swipes, pinches, and taps to different functions. Want a four-fingered click to launch Spaces? How about a two finger pinch-in to zoom on your screen? These are features that should have been included by default, but that’s no problem thanks to MagicPrefs, the ability to fully customize gestures is truly remarkable. If you have a Magic Mouse, I highly recommend downloading MagicPrefs and checking it out, it is an absolute must-have, it brings the real magic to your Magic Mouse. It’s a free download and there’s a lot to explore. Do you use Magic Prefs? Do you have any particular tips for Magic Mouse? Let us know! This rocks…Just the improvement in mouse tracking speed alone is worth the download. Anyone notice that Magic Mouse is a battery hog? I tried out magicprefs for a while and it does rock. I found MagicDriver from steermouse to be a better app. It is less buggy, and I like how he used the surface better for gestures and buttons. i used this for a while and it does work quite well. great features and handy yet a little buggy in some areas. however, after updating OS X to 10.6.2 and later i found that MagicPrefs somehow interferes with my secondary click on my glass trackpad. even after updating MagicPrefs and the os i still had problems. after becoming fed up i finally deleted MagicPrefs and all its files and….voila!….secondary click on my trackpad is back to where it should be.